Longmorn is a Speyside distillery that is Owned by Pernod Ricard and is mainly used for blending, the official range is composed of and NAS (Distiller’s Choice) and a 23yr old. I believe there might be some older expressions also. I had heard mixed reviews on this whisky although more in the love it than hate it camp, I mostly heard of the backlash when they pulled this 16yr old off the market for a bit only to replace it with a version at more than twice the price, yikes! Nose: Fresh, malty, mixed nuts, loads of apples, apricot paste and beeswax. Like a Glenfiddich but with more guts. Great sherry integration, spice, currants, vanilla, the richness of oak and cedar but also a firm sharpness. Palate: Dried herbs, roasted nuts, jam made from stone fruits. It then is almost like Fino sherry is some ways with that slightly sour yeasty side. It’s tingly on the tongue almost effervescent. Finish: It’s long and mouth coating, almost cognac like, minus the sweetness. There's a lot of oak here but the fresh sharp aspect keeps it from being crazy. The ABV delivers the right intensity that is needed to push the flavors forward. The Blab: Why is this so expensive? No but seriously, I really love this whisky it is a superbly crafted malt but there's no way it's worth the 260$ they are asking for. I used to think a lot of the backbone of the good Chivas Blends I had tasted was Aberlour I realize that Longmorn is probably the one giving them some weight. @cricklewood - $260!? Sheesh! Doesn't sound like it would be 'up my alley', as it were, but you describe it very appealingly nonetheless :) Thanks for the review. @RianC, I really liked this whisky it came hot on the heels of a tepid Glenrothes 18 and so I wasn't expecting much with this one either but found it quite vibrant, a must try whisky in my book, just not an essential purchase. What a bottle...Glass, paper, metal, leather, wood. What about the components inside the bottle? Non-chill filtered, 16 years in oak - sherry? bourbon? Who knows. The label does not say. It is a Speysider, so I would assume some sherry cask influence. Soft meaty rancio on the nose. I feel like this note is often in sherried whisky. It reminds me of roasted meat, specifically the Asian pork specialty, Char Siu. Spiced apples. Not bad. Well, I don't like what water does to the nose. The original notes are there, but muted. On the other hand, the burn is gone, and I am left with a taste that I can evaluate. Wood - like sucking on a Popsicle stick. Canned lychee fruit. A bit of white dog? Not a fan. Without water, there is a nice enough nose, but the burn is quite rough. With water, the nose is neutered, the burn is tempered, but the taste which comes through, fails to impress. Neither option is wholly satisfying. Pasadena. Not a repeat purchase. I agree the 16 is a bit weak. I have two bottles left of the 15, which is quite delicious. If you happened to live in Portland, I would have you over for a dram or two. Merry Christmas, Onibubba. I feel your pain. The 16 is a let-down to me, as well, especially after the 15's understated polish. Spot on, the poshy bottle is a waste of money and resources. The packaging and bottle is more difficult to recycle. Longmorn should take a look at Deanston, no window-dressing, just the product, the way it should be. It's the liquid that counts! I still don't know what to think of the taste, I'm not impressed yet. When I get my head around it I'll write my review. First impression on the nose was ethanol so thought I'd just leave it for a few mins to open. After a bit of breathing the caramel and apple aromas came through but still seemed a tad overpowered. Just a touch of water was needed to reveal a much more grassy hay-like aroma. The palate was very pleasant smooth caramel-like with some grassy undertones although not overly complex. But the finish was odd - didn't like the aftertaste at all. Overall pleasant if unspectacular - the score for me was dragged down by the finish. This is Longmorn's standard expression. 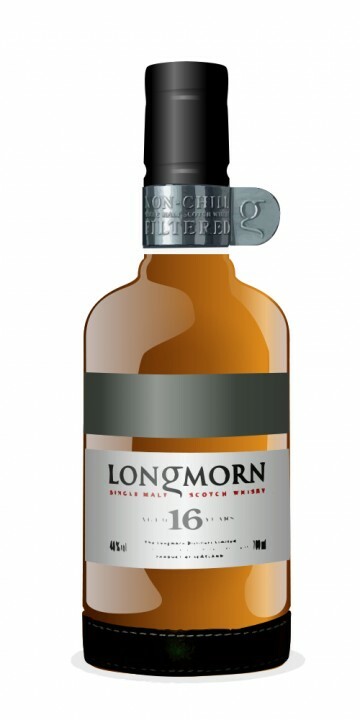 It replaced the 15yo in 2007 and was created in an effort to reposition Longmorn as a premium brand, which is probably why it comes with some very nice packaging, including a leather wrapped base to the bottle. Compared with the 15yo the ABV increased from 45% to 48%. The nose yields chocolate, apple, caramel and some herbal notes. All in all a promising beginning. The palate is medium-bodied and smooth. I detected honey and some spicey notes. This is not bad albeit a tad dull. The finish is medium long and quite mouth-watering, however it ends in a rather strange aftertaste, similar to fennel. Before I tried it I thought that this single malt had it all: a famous name, good volume with 48% ABV, and some really nice packaging. Sadly, it turned out to be rather bland with a disappointing finish. This clearly is not my cup of tea. Expensive and underwhelming. The Glenlivet 18 is cheaper and much more drinkable as is Glenfarclas 15. This is my first Longmorn. Giving the fact that not a lot of longmorn official bottling exist, it is not a surprise. What was a surprise is how distinct this speysider was. First sniff...alcohol, this thing is "only" 48%. I say only because I have cask strength whisky that do not hurt the nose as this dram does. When used to it, apple and honey starts to come out of the fog. a little bit of water brings this baby to life... Definitively honeyed apple, but with spices, toffee and nuts. Palate: dry fruits going on oaky notes going on fresh grassy notes. Finish: very green fresh grass. special... The dram is developing over time. Is it birth of true love, maybe not, but I would be very interested to try some other expressions from independent bottlers. It is far more than just interesting ! Box: Awesome magnetic clasp for top-hinged door lid. Bottle had leather binding on bottom half. Cool. Nose: Fresh poundcake. Slight tang or bite. ? Palate: Oak, honey. Well-balanced sweetness. Boatshed on a summer day. Slight warm wax. Blackcurrant. Finish: Full, long. Bit of peat. i'd love to find the 15. I live in Virginia, in the US, and the state controls liquor stores -- so selection is limited. But I'll be in Texas for vacation soon, so maybe! I am a novice at writing tasting notes, and I have to say that the 16yr gave me fits when I tried to write about the nose (maybe that's why I went a bit long on the packaging comment). I couldn't really pin down the nose's defining characteristic for me -- could smell it but not verbalize. The only word that's come to me since, albeit without the whisky in front of me, is a slight fennel edge. ? If you like the 16 year old, you really should seek out a bottle of the now discontinued 15 year old. The 15 is, in my humble opinion, a truly stunning whisky and way above the 16 year with its fancy new packaging. They have tried to rebrand it to appeal to a worldwide market, but trust me, the 15 is so much better! I own both and i am on my 3rd bottle of 15, while the 16 remains 7/10 full. Nose: Nice and fresh and green. Green grass and herbal notes. Taste: Bits of citrus and grassy. Finish: Long, dry and a bit of spice. This is the standard bottling of Longmorn, replacing the old 15 Year Old since 2007. The nose is rife with cookies, filled with fruit. Pears and apples, primarily. Very sweet with a bit of vanilla, some marzipan, malt and slightly oaky. But still, the nose is one-dimensional, with little depth. It has a creamy mouthfeel and tastes quite spicy at first, with honey, raisins and nuts. The fruit from the nose returns. Silky soft! The finish is lingering, dry and quite spicy. This is a nice, albeit complexless, summer dram. I have always enjoyed the Longmorn 15 yr old expression. Its complexity made it one of my favorite speyside whiskies. I take it the 16 year old expression fails in comparison? Will not buy the 16 as there are so many others that are in its price range that are superior drams. I have 4 bottles of 15yr old left and will be very sad when they are gone. Nice dram, and beautifully designed package. nothing special – light and not very complex.